A new report finds health systems are falling woefully short of ensuring the most vulnerable children have sufficient access to prevention and treatment services in 15 countries that account for 70% of global pneumonia and diarrhea deaths in children under five. Globally, pneumonia and diarrhea together led to nearly one of every four deaths that occurred in children under five years of age in 2016. 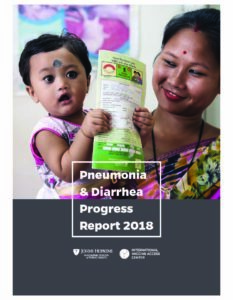 The 2018 Pneumonia & Diarrhea Progress Report—released ahead of the 10th annual World Pneumonia Day, on November 12, by the International Vaccine Access Center (IVAC) at the Johns Hopkins Bloomberg School of Public Health—describes efforts to fight pneumonia and diarrhea in 15 countries with the greatest number of deaths from these illnesses.